What's the right price to charge for your Business-to-Business (B2B) product? During my short time in consulting, my group had helped several companies ranging from startups to fortune 100 companies figure out what a technology product or service was worth to them. This was always mostly driven by the process of comparing what the total cost of a product or service was to the overall financial benefit the company could derive from buying this product. Now, that is on the buyer's side. Having knowledge of how [we conditioned] buyers [to] think informed how I now taught entrepreneur's (sellers) to price. As an investor, I have been involved in advising our portfolio companies on pricing strategies, especially in the B2B space where buying decisions are more rigorous and data-driven. Visibility into this process helps startups identify which product features drive the most value for their customers. These are the ones to hone in on. The very important question of what to charge is one startup founders find themselves having to answer at every point of their product life cycle, particularly in their earlier days. So, let’s run through the motions. You’ve started your company, created an MVP, launched your first (maybe only) product, put it in the hands of a few customers for testing, received great feedback, and now they have indicated that they would like to pay for your product or service. You’re in a great place, perhaps, the best place for a budding business—someone wants to pay for your product. "What do I charge?" is such a big deal because you’re trying to ensure two things with the pricing. One, high enough so that your business can become profitable faster—two, low enough to keep potential customers them interested. There are three common ways companies arrive at how much to charge for their product or service. Namely: cost-based pricing, benchmarking and value-based pricing. Cost-based pricing refers to pricing in reference to the cost of production. With this approach, entrepreneurs and companies simply add a (percentage) margin to their cost of production and make that their selling price. Benchmarking refers to pricing in relation to similar or comparable products in the market. Value-based pricing refers to pricing according to the value your customers are deriving from the product. This type of pricing is a little more sensitive and will be the focus of this article. Value-based pricing asks the simple question; "What will my product help my customer achieve?" What will your product achieve for the customer? Keeping it simple, businesses are in existence to make a profit. There are two ways to guarantee profit; make more money and reduce costs incurred in running the business. If your product helps your customers (a business, in this case) sell more or makes them able to charge a premium per user for their product, you have a pricing advantage here. What you want to do is typically collect a percentage of that additional net revenue (I’ll advise somewhere between 40 and 60% depending on how many competitors you have). If your product can instantly result in net savings for your B2B customer, you’re where you want to be. 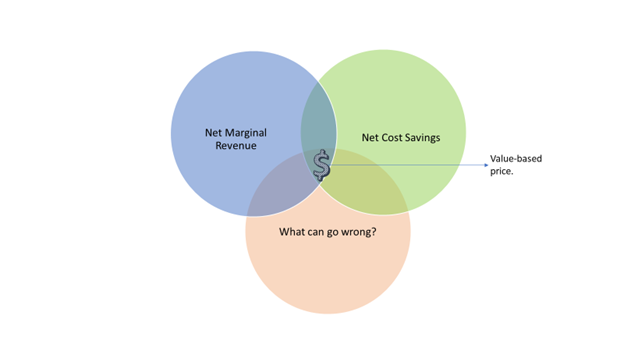 When I say net savings, I do not only mean that our customers save money, but the amount in savings must be higher than the total cost of buying and using your product. This is usually through savings experienced by expending less resources to achieve the same level of productivity that their legacy technology would have delivered. In 2016, I was trying to help a startup that had raised millions of dollars in venture capital (VC) funding while validating the value of their B2B product. They had developed a technology that helped organisations make virtual meetings and presentations a lot more real using a combination of VR and remote sensors. The company installed fancy meeting rooms where employees of their customer could make vivid presentations using a wall full of HD screens and a “magic wand” to move things around on the screens. This was super cool to use or even look at. The only problem the company had was that it neither made meetings faster (it took longer to set up) nor was it significantly more productive than their closest competitors — Zoom and Skype. It was impossible to price this product any higher than these competitors even though it costs more to produce. Needless to say, this company is no longer around. What are the chances the customer will not derive the expected additional revenue or cost savings? This is usually a factor for being able to charge a premium or having enterprise customers insist on a discount. The better you can communicate to B2B customers that they will realise the expected value your product promises, the higher your chance of charging a premium for your product. It’s very common and tempting as a young company to focus on how far you have come to develop your product. However, never forget to price based on the value your customers will derive from using your product. Good luck pricing to win! Olu Oyinsan is Managing Partner at Oui Capital- an early stage venture fund that invests in promising technology startups in Sub-Saharan Africa. Check out his article on how to get out of banking. You can also follow him on twitter @theafrovc or learn more at www.ouicapital.vc. A version of this article first appeared on his Medium.